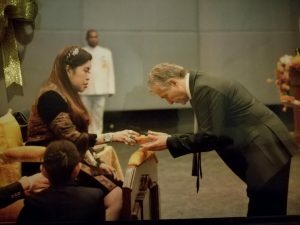 Her Royal Highness the Princess of Thailand, Prof. Dr. Chulabhorn Mahidol presents a token of appreciation to Prof. Ciro Isidoro, as an invited Speaker at the International Conference on “Innovation in Cancer research and Care” (December 18-20, 2017; Chulabhorn Research Institute, Bangkok) organized by the Chulabhorn Royal Academy to honour the 60° Birthday Anniversary of HRH the Princess. EVENTS Bangkok, Chulabhorn, Isidoro, Princess, Royal Academy, Thailand. permalink.